We're off, on a second visit to the Clifford E. and Melda C. Snyder Research and Extension Farm, northern most research facility of Rutgers, the State University of New Jersey. The other sites for this land grant university are in southern New Jersey, where weather and soils are different. It was May when we made the first visit. The apple trees were in bloom, and I'm not even sure the tomatoes were planted out. 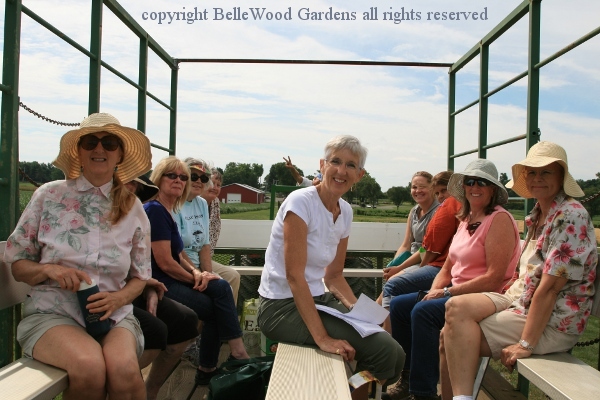 So the "never enough time in the garden" cohort of the Tohickon Garden Club are here for another morning's tour and a wonderful explanation from Geoff Holvey Slifer of the different research projects underway at the facility. Geoff has leapt from the driver's seat, up on the fender, and giving us another of his inimitable explanations of what's happening. Not quite sure who he's channeling. Looks rather like Charlton Heston as Moses in The Ten Commandments. He gave a wonderful presentation last October, at the garden club's Apple Fest . An aside - this is what I saw at the farm across the road from the Snyder entrance. It has been dry, quite dry lately so it will be interesting to see how the trees and plants are growing while we are on our tour. 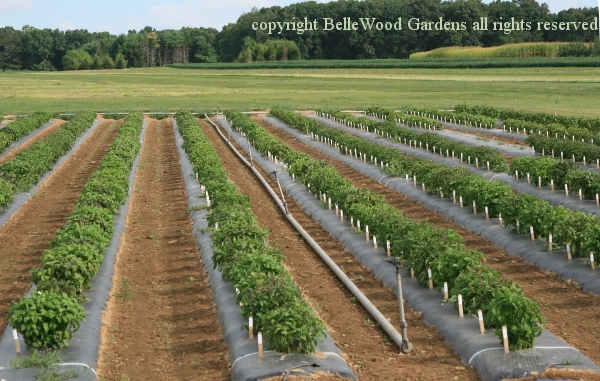 There's a multi-year basil trial under way. Commercially grown basil often becomes mildewed. There are resistant strains but they don't have great flavor. This project is cross-breeding the two strains, growing out the progeny, and see which have both flavor and mildew resistance. Problem this summer - it's been so dry that none of the basil is showing signs of mildew. They had to put in overhead sprinklers to keep the foliage wet so the disease has a chance to grow. It's a doctoral research project, with yet another year to go. 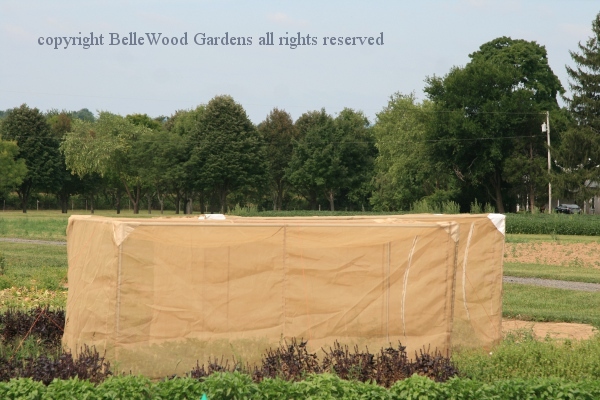 In this test plot some basil plants are caged to isolate them from random chance pollination. There are bees inside the cages to on;y cross-pollinate the intended plants. Clever researcher - notice the purple basil plants just outside each cage. If any of next year's seed-grown basil plants have even a tinge of purple it's a clear sign of contaminating outside-the-cage pollination. Update 11 September: Basil's flavor is a subjective thing. How it tastes to me may not be how it tastes to you. And flavor is an important issue with this basil breeding research. So at the Great Tomato Tasting last week people were also invited to taste different basils, and comment. Very useful input for the research project. The pear trees were in bloom when we were here in May. Now the trees are fruitful. So tempting. But we cannot eat any. Not even one little nibble. These trees are part of a trial. All the fruit must be measured, counted, weighed. No sampling allowed. So sad. The project is for super slender spindle spire growing. 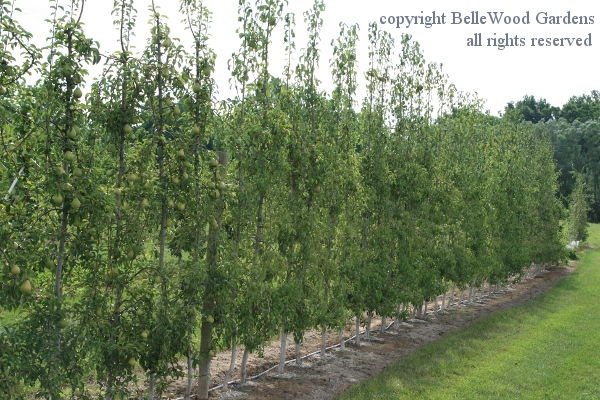 It packs the trees in really close together, narrow and upright. 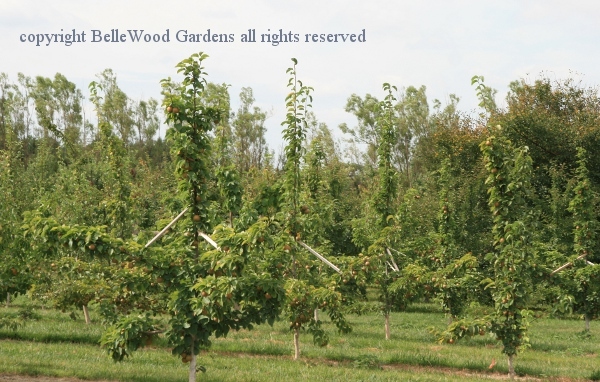 Expensive to install, front end loaded you might say, because so many more trees can be wedged in per acre that with the traditional method. Yields are high and trees bear sooner. The trellis they're attached to obliviated the need for sturdy trunks and branches. They put their energy into flower / fruit rather than wood. Asian pears. 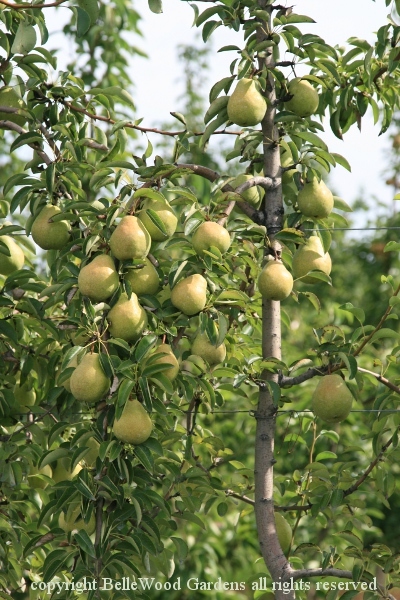 Problem is that unlike other fruit that can be picked under-ripe, Asian pears must be picked at just the right stage. And the window of opportunity is small. 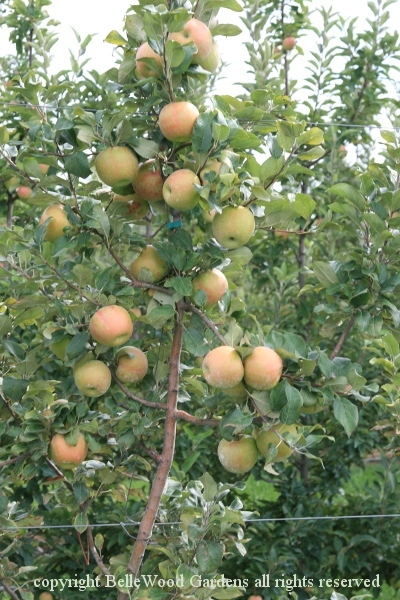 High value crop, fruit sells for more money than regular pears. 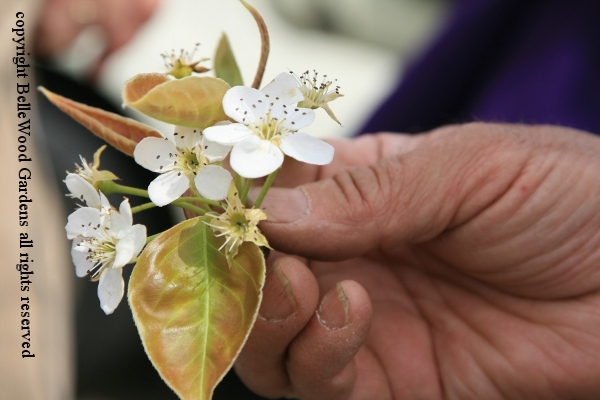 This research project will provide information useful to the commercial growers. Notice the spreader bars that force the branches outward. 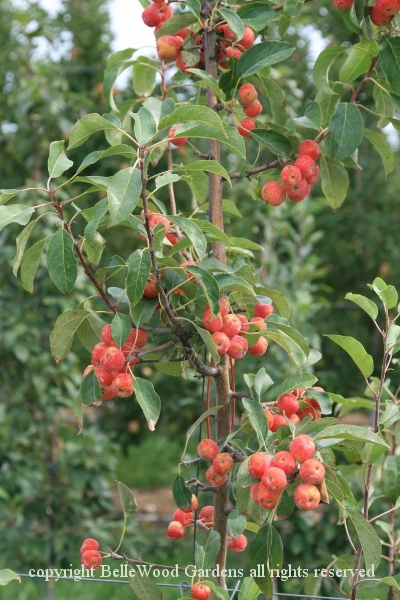 More sunlight reaches the center of the tree, better fruiting. Easier picking too. to the brown marmorated stink bugs that damaged some. as pollinators for the cultivars under review. Update Thursday, 11 September: I brought my WWOOFer, JoAnna, here today. Curtis gave us a really good 30 minute tour with some highlights of various projects. An interesting one is underway, using Sunn Hemp, Crotalaria juncea. Here at Snyder Research Farm it is being studied as a green manure cover crop. Other potential uses are with the lignified fiber obtained from its stem, ands it is is also being looked at as a possible bio-fuel. Sunn Hemp is not the hemp you might be thinking of. It is a tropical Asian plant of the legume family. The apparent niche for Sunn Hemp might be where hairy vetch (a different plant used as green manure) winter kills or grows poorly in the spring, because much of Sunn Hemp's growth is made in late summer and early fall. One concern is that lignified fiber. Not one but two mowers were put out of service when mature plants were cut down just the other day. A possible continuation of the study, next year, would be to plant a strip. Let the plants make some growth, then mow a section every two weeks. The goal - find a balance between the maturity of the plants, the quantity of nitrogen that's been added to the soil, and the lignification of the stems. Cool stuff! There's some more information about Sunn Hemp here. 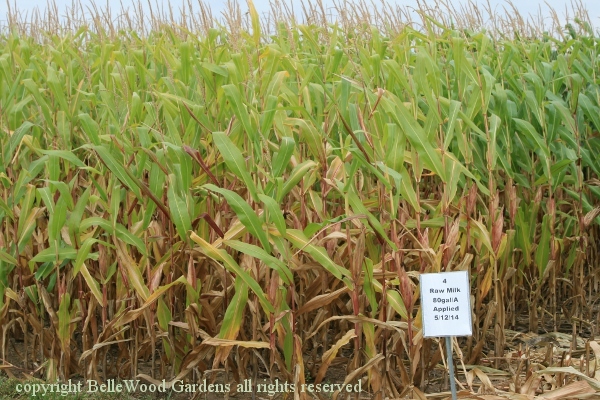 Update Thursday, 11 September: Another fertilizer research trial is exploring alternate fertilizers for field corn. 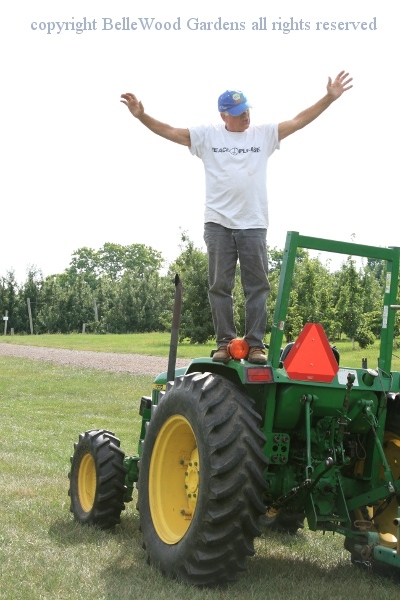 "There are many grower testimonials in the organic media about the value of alternative fertilizers. 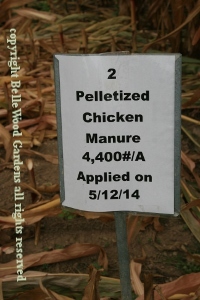 This experimnt is conducted to compare commercial fertilizer at the reccommended rates to three alternative materials: chicken manure, liquid fish, raw milk, and an untreated control. The results will demonstrate the value of these materials in field corn production." Curtis said the the effect was most noticeable in the younger plants. Growth looked almost like a sine wave, cresting up and down in response to four different fertilizers. Not as visible at this late point in the growth cycle. 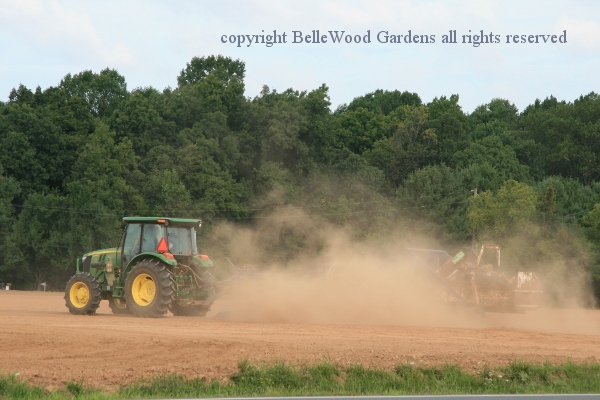 Fertilization for projected 150 bushel / acre yield. Expected outcomes - the commercial fertilizer will significantly outyield the alternative products. 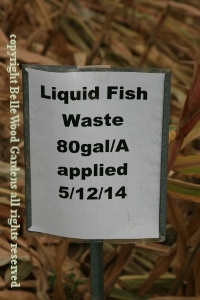 liquid fish waste and pelletized chicken manure. 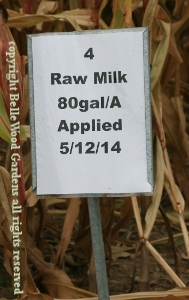 Milk was the least effective, commercial fertilizer gave the best growth. 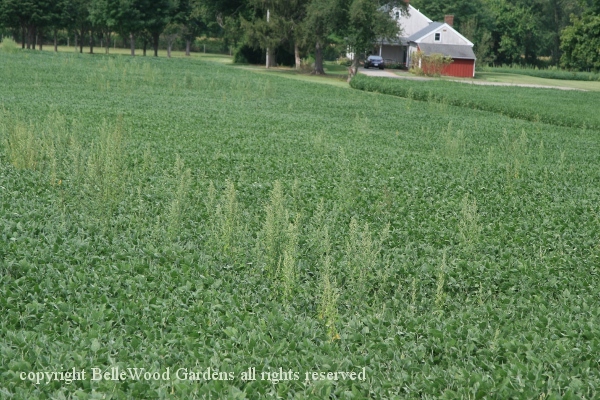 A field of soybeans, with weeds. "Know what's going on?" inquired Geoff. "Non-GMO!" chirped guess who. "Judy's wrong." said Geoff. Turns out these are Roundup Ready soybeans. And the weed, this particular kind of weeds, is resistant to Roundup. After all, Nature's game is survival. There reason for the several fields of soybeans is not a trail or test. 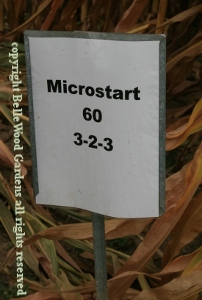 Two-fold: firstly - as legumes the plants return nitrogen to the soil and thus improving its fertility. Secondly, the soybeans are sold, with the income going to the research facility's operating budget. 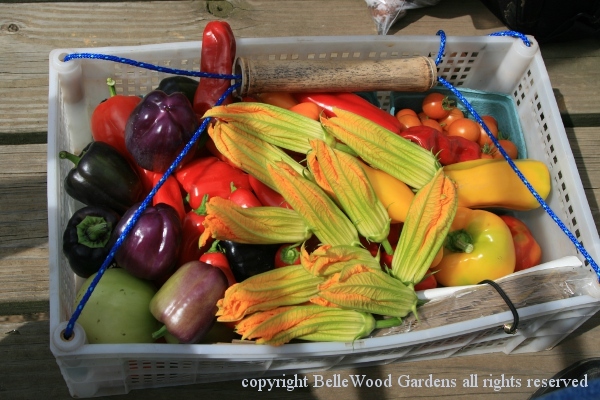 To finish off our tour we were allowed to pick tomatoes, peppers, and summer squash from a non-research plot. 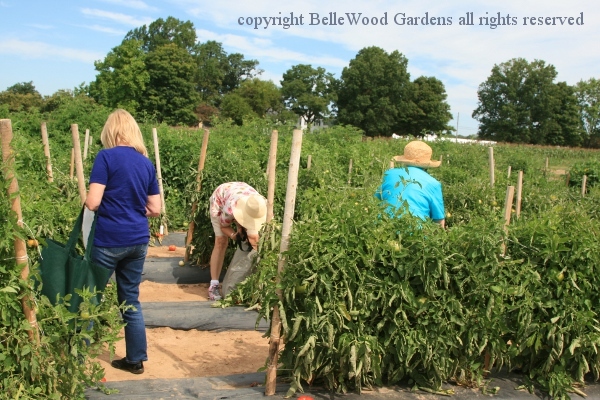 The tomatoes in last week's Great Tomato Tasting event came from here. 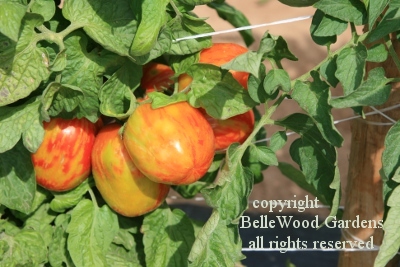 There were some beautiful, unusual tomatoes, such as these stripe-y 'Plum Tigris'. 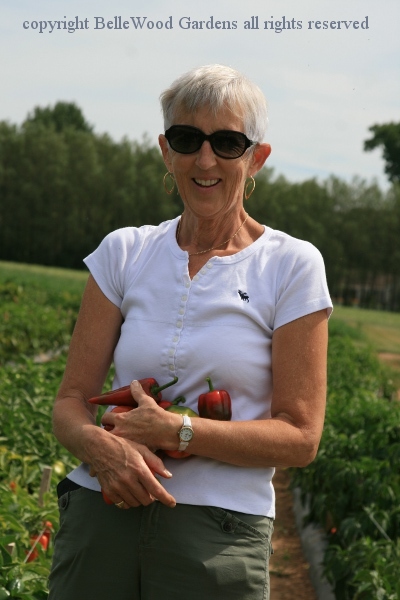 Sally has an armful of peppers. an informative tour, a lovely day, and delicious eating afterwards.